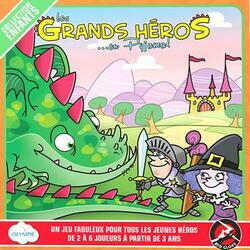 Les Grands Héros... En Pyjama ! Wake up! Wake up! It's time to go fight the Dragon! But... where are your armor?! Each player plays a hero, and will have to find his clothes as soon as possible to go to the Adventure! Also features a Memory variant, to make the game a little more challenging! Lotto or memory game to dress up your characters. For the lotto each player in turn turns over a tile. The player to whom it belongs receives it. For the memory game, the tiles are placed on the table face down. Each player in turn returns one. If it matches his character, he wins it, otherwise he puts it back on the table face down. When you flip a dragon, you have to put a tile already won back on the table. To win you have to be the first to collect all the items in your character.